Due to the Legislative changes made in Nevada, State Agent and Transfer found it necessary to diversify in order to provide feasible options for its clients. 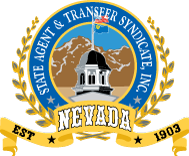 We registered with the Wyoming Secretary of State in 2015 as State Agent and Transfer Syndicate, LLC to become a Commercial Registered Agent with the same level of service as we provide for Nevada. You now have the option to either form a new Corporation, Limited Liability Company or Limited Partnership in Wyoming OR offer you the ability to Re-Domesticate your entity to Wyoming in order to save annual fees. New Formation: $100 for formation and $150 for Registered Agent fee. Of course, prior to any decisions, we strongly recommend that you consult with your Legal and Tax Professionals prior to making in final movements. If you ultimately choose to move your entity to Wyoming, State Agent remains your point of contact, same phone number, same address, same team; we handle everything! We are prepared to make your transition as easy as possible. We prefer to make your transition in the month you are currently incorporated in, but prior to the 15th as Wyoming requires documents from the home state and those must be ordered. Re-Domestication fee: $500 (includes all fees). Annual fees: $52 for Annual List and $150 for the Registered Agent fee. Please talk with your Legal or Accounting Professionals about this option and then let us know, we will prepare documents and send them to you.